18 Historic Scenarios - Now YOU are in command! Generals, Marshals & Tacticians is the fifth expansions for the Commands & Colours Napoleonics game system. There are 18 historical scenarios, a few new units, a couple of new game mechanics including Garrison Markers and rules for forming and battling with a Grand Battery. But what really makes this expansion stand out is the introduction of a deck of Napoleonic Tactician cards. These 50 cards are designed to spice up each and every player's Napoleonic experience by enhancing the role of the leaders on the battlefield, without adding additional complexity. Tactician cards may hinder the opposition army, enhance a player's units or may instantly change the course of a battle. In addition to the new deck of Tactical cards, there is a brand new updated deck of Command cards. For the most part the new deck of 90 Command cards has not gone through any major changes, its main focus is on how the Command cards work in conjunction with the new deck of Tactician cards. 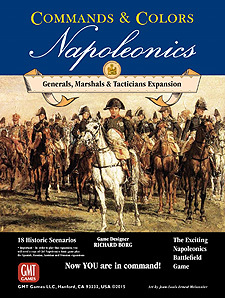 In my opinion, this expansion will add an exciting new command level to all Napoleonic scenarios and impact your Commands & Colours Napoleonic gaming like no other expansion has done to date. 35 Wood Blocks 22mm x 22mm x 8mm, 16 Russian Green, 3 Prussian Grey, 12 British Red and 4 French Blue. Important: In order to play this expansion, you will need a copy of the basic Commands & Colours Napoleonics game plus the Spanish, Russian, Austrian and Prussian expansions.